Emily's Recipes and Reviews | UK Food Blog | Leicestershire : island grill restaurant, lancaster london. island grill restaurant, lancaster london. Part of the Lancaster London hotel by Hyde Park, Island Grill is a contemporary restaurant which prides itself on fresh and sustainable cuisine. With beautiful food photography across their website, the gallery of imagery alone is enough to make your mouth water. In addition, the restaurant's accolades include two AA Rosettes and three stars from the Sustainable Restaurants Association. The interior is modern and elegant, with dark glossy tables, metallic lighting and pops of red. Succulents and candles on each table give a fresh and welcoming feel to the otherwise mostly monochrome palette. The bar staff were immediately attentive, serving me straight away whilst I waited for my friend. In our own time, we were shown to our table and taken through the specials and wine list by a friendly but professional waitress. We shared a bottle of the Chilean Lorosco Reserva Sauvignon (£19.50), with a crisp finish which went with our seafood starters. I'd gone for the Crab Tian (£10.50), with chilled avocado soup, caviar and beetroot crisps. Priding themselves on sustainability and foodie footprint, this was billed as Devonshire crab, just as with the Kent sourced seafood, Suffolk roast chicken and Gressingham duck. They even keep their own bees on the roof, with honey which goes towards a lot of their breakfast menu items. It was a very light starter, beautifully presented with a variety of interesting textures. The crab was great quality and married well with the other sweet and earthy elements. My dining date went for the Pan Fried Scallops (£10.50) with raised puy lentils, pancetta crisp and a finish of red wine jus.Again well presented with well-thought-out textures, the starter dish combined the classic combination of scallops and pork, with a smokey flavour and depth from the red wine. For mains, we went for the Island Burger (£15.50) and the Lamb Shank (£19.50). Featuring cheese, bacon, tomato, gherkin & red onion, chips or side salad, the burger patty is cooked to your liking from medium well to well done. As a burger fanatic, Sophie was the perfect tester for this particular main (check out her Insta for many pictures of tasty burgers as well as her awesome baking). As burgers go, she seemed impressed. The bun came pink and had some tasty fillings too. The chips weren't so impressive, but really it was all about the burgers here. My slow cooked lamb came with creamy truffle mash and roast carrots and parnips. Finished with a lamb jus and hints of mint, this was like a posh Sunday dinner. The mash was deliciously luxurious with a real kick of quality truffle. Although a bit fatty as expected with this cut of meat, the lamb fell off the bone and was really flavoursome and moist. A well presented and well seasoned dish that I would recommend. 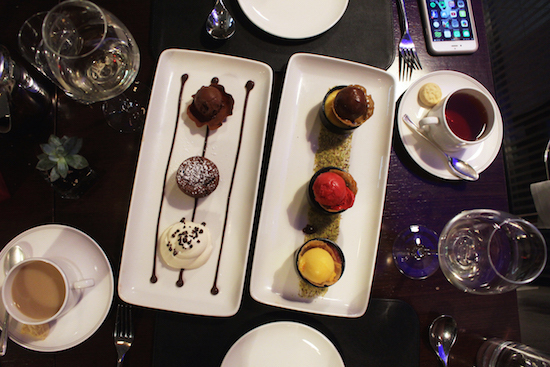 Dessert came in the form of a Crème Brûlée selection and the Chocolate Trio (£5.50). Think passion fruit, dark chocolate & raspberry brûlée with passion fruit, raspberry and Valrhona chocolate sorbet neatly presented on a rectangular plate. The chocolate ensemble was made up of a dark chocolate fondant, white chocolate & coffee foam and a Valrhona chocolate sorbet - a chocoholics dream come true! I particularly loved the fluffy coffee cream and the chocolate tart - the sorbet was unsurprisingly light but I couldn't get on board with the icy flavour and texture with the expectation of creamy chocolate. I can see the though process behind it though, as chocolate ice cream would have been heavy. The crème brûlées we undeniably cute and would be the ideal date dessert to share. Lovely colours and flavours, with rich ice cream and inventive combinations. There wasn't the usual "tap" on the surface of the crème brûlée but the flavours were good and it was more like a creamy mousse. Overall, the service and quality of food was great. Interesting dishes, responsibly sourced and with great presentation and atmosphere. This isn't just a restaurant as part of a hotel, it's definitely a dining destination in its own right. For drinks, a special occasion, date night or catch up with friends - plus a great location for a walk around Hyde Park to burn off those desserts! Have you ever been to Island Grill? What are your favourite restaurants near Hyde Park? Nearest tube: Lancaster Gate. Although at the time that station was closed, so I walked across from Hyde Park Corner. We dined as guests of Island Grill. All opinions are honest and my own. the queen's head, belton, leicestershire. strawberries & cream hot chocolate. eat your greens with goodlife.